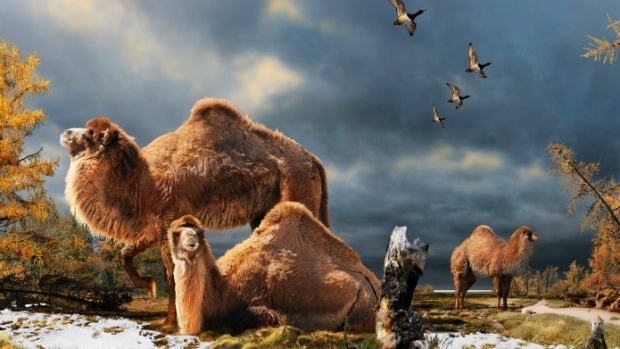 Natalia found the first evidence of a fossil giant camel in the Canadian high Arctic in 2006, and collected additional remains in 2008 and 2010 field seasons. The resulting publication (Rybczynski et al 2013) showed that this camel was likely related to the giant camel of the Yukon, Paracamelus, based in part on collagen fingerprinting techniques. The manuscript is also significant because it reports the first terrestrial cosmogenic nuclide dates for two High Arctic Pliocene sites: the Fyles Leaf Bed site, which yielded the camel remains, and the nearby famous Beaver Pond site. The results suggest an age of approximately 3.5 million years for these deposits. Currently, Natalia is supporting research to better characterize the morphology and diet of the “Paracamelus”, working in collaboration with D. Fraser, G. Zazula, and C.R. Harington.